Fire trucks lined Grand Blvd. Saturday afternoon and an American flag hovered above a crowd gathered outside the Sprint Center. 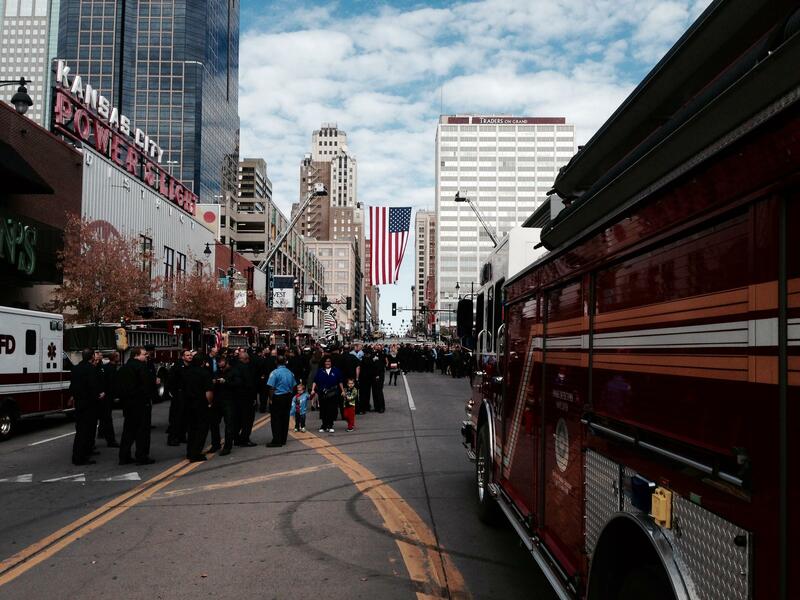 They were there to honor two fallen Kansas City firefighters. Larry Leggio and John Mesh were given full public honors during a memorial that drew thousands to downtown Kansas City. Mayor Sly James and Kansas City Fire Department Chief Paul Berardi spoke first to the crowd before presenting folded American flags to the families of the deceased. The flags had flown above the U.S. Capitol Monday, the day the two firefighters died when a wall of a burning building along Independence Ave. collapsed on them. "Each of us as made a wish upon a wish that Larry and John were right here, right now, wearing Royal blue with their family with a beer in hand, or sitting around the kitchen table at the firehouse getting ready to watch the Royals pre-game," said Chief Berardi. "Tragically that was not to be." Joe Mike Leggio, Larry Leggio's brother, spoke about the Leggio families' 50 years history with the Kansas City Fire Department. Joe Leggio said their father was a 26 year veteran of the department, and Larry always wanted to follow in his father's footsteps. "Larry spent 17 incredible years with this department, and he loved every minute of it," said Joe Leggio. 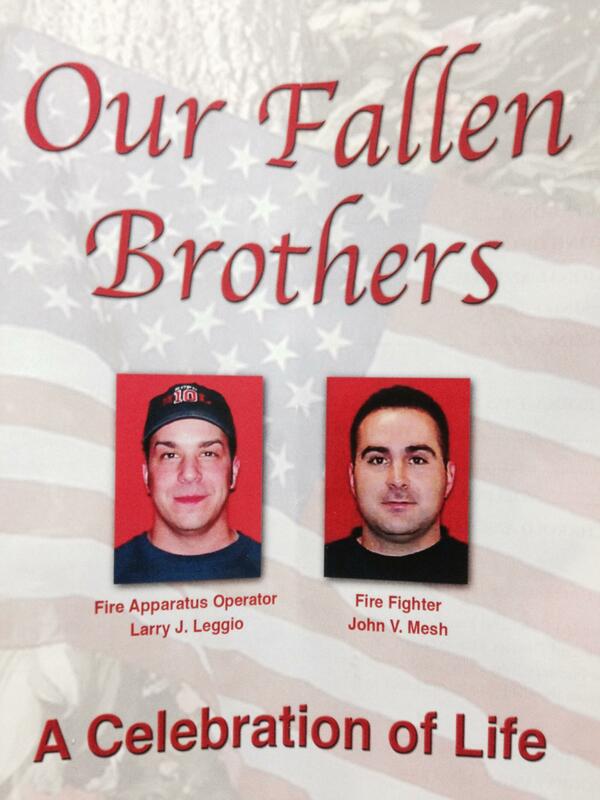 "Larry Leggio and John Mesh will live in our hearts forever. Our families will find strength knowing that these brave men died saving others. We love you both, and we will never, ever forget." Giovanna Caponetto, John Mesh's niece, spoke on behalf on the Mesh family. She praised Mesh's love for his four daughters and his humble composure in the face of his job as a firefighter. "He wore his badge of honor not for any kind of recognition, but for the pride he had in doing the best he could at upholding the proud heritage of the Kansas City Fire Department brotherhood," said Caponetto. The memorial ended with the ringing of the bell that Chief Berardi said represented the end of a firefighter's duties and the return to quarters. "Their tasks completed, their duties well done, they're going home." 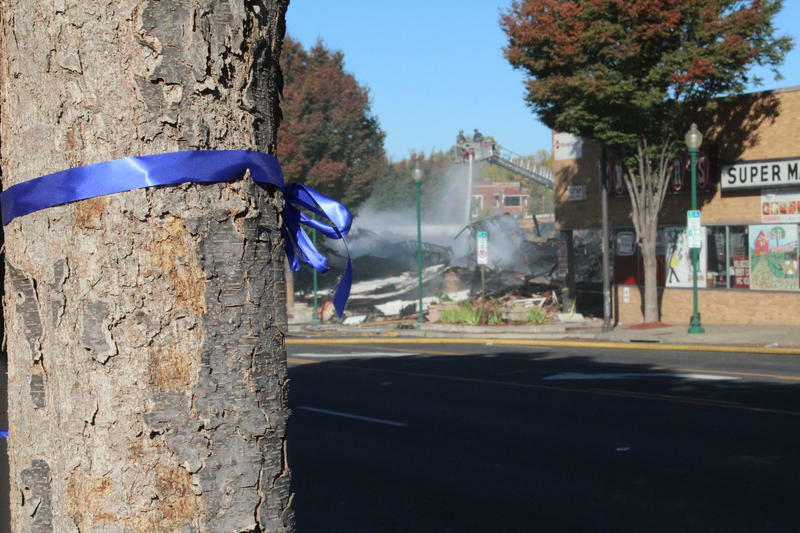 An ongoing investigation into the blaze was suspended so that the investigators could join the ceremony. The investigation is expected to end sometime next week. In official parlance, the death of a firefighter is called a Line of Duty Death, or LODD. And the protocols and procedures for handling one run to several pages. The formal, sometimes antiquated, language of the protocol lends it the gravity with which fire officials approach this somber task. "Our methods may change, but our goals remain the same as they were in the past, to save lives and to protect property, sometimes at a terrible cost. This is what we do, this is our chosen profession, this is the tradition of the fire fighter," one section of the protocol reads. 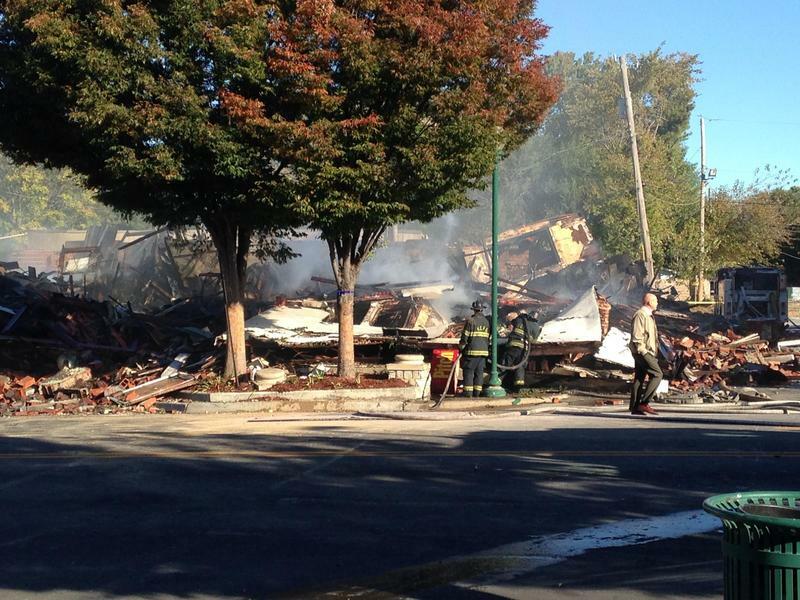 Federal fire investigators continue to sift through the burned out building in the Historic Northeast that collapsed Monday night, killing two firefighters. Fire investigators were finally able to enter the building Friday, says Bureau of Alcohol, Tobacco, Firearms and Explosives spokesman John Ham. “They literally have to think about every footstep because they’re basically on the roof of a three-story building that is down below them,” Ham says. This past Monday, Kansas City bore witness to the best and the worst that can happen to this town. The same night that saw the Royals win their battle in Houston over the Astros … saw two Kansas City, Missouri, firefighters lose their lives as they battled a two-alarm fire on Independence Avenue. Steve Kraske talks with IAFF Local 42 President William Galvin about the traditions and protocol of honoring those who lose their lives in the line of duty. As the brisk morning morphed into a warm autumn afternoon, residents and business owners began to gather on the perimeters of the site along Kansas City's Independence Avenue where two veteran firefighters died saving civilians in an apartment building fire Monday night. Seventeen-year Kansas City firefighter Larry Leggio and John Mesh, 13 years with the force, died outside the structure when part of the burning building crashed down on them . According to reports, they had just brought two residents from upper story apartments to safety. Kansas City Fire Chief Paul Berardi identified the two Kansas City firefighters killed in a blaze Monday night as Larry J. Leggio and John V. Mesh. Leggio was a 17-year veteran who worked on Truck 2, Station 17, as a fire apparatus operator. Mesh was a 13-year veteran firefighter assigned to Pumper 10. An emotional Berardi said Leggio leaves behind his wife and mother. Mesh had a wife and four young daughters.